On this day, 7 December 1976, Grenada witnessed its most contentious general elections to date when opposition parties formed a coalition, the People’s Alliance (PA), to challenge the electoral monopoly of the Grenada United Labour Party (GULP) of Prime Minister Gairy, but lost. 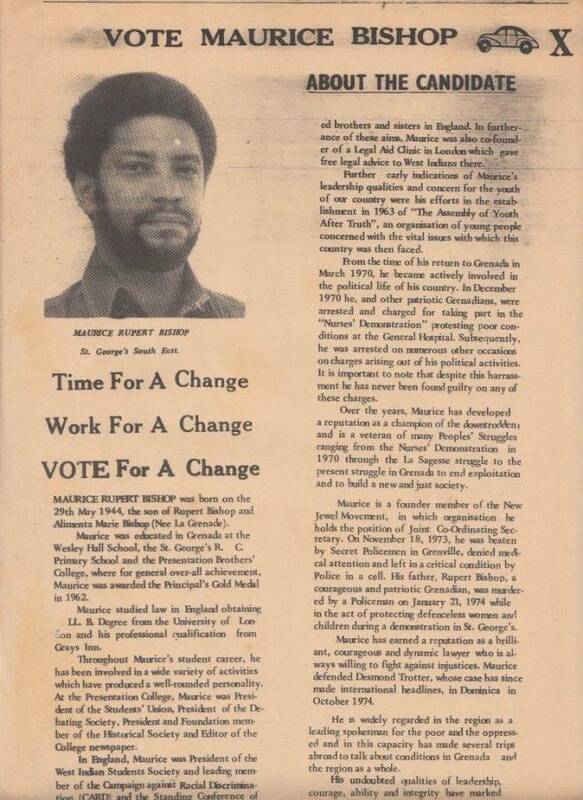 In an attempt to end the GULP’s seemingly unshakeable electoral monopoly, the three main opposition political parties–the leftist New Jewel Movement (NJM) under Maurice Bishop (nominating seven candidates), the centrist Grenada National Party under Herbert Blaize (nominating five candidates), and the pro-business United People’s Party under Winston Whyte, a former GULP senator (nominating two candidates)–formed a coalition party, the People’s Alliance, to contest the 1976 general elections. Ideological differences between the parties created some tension, as was evident with the establishment of the PA only a few days prior to the deadline for nomination. The PA brought together three politically diverse groups, with only one thing in common, a strong desire to be rid of PM Gairy and the GULP. The failure of the NJM to remove Eric Gairy from power by mass protest in 1974 had forced its leaders to participate in parliamentary elections, even though they believed the electoral process to be “woefully deficient.” The youth vote, from which the NJM derived much support, became important, especially since 18-year-olds were eligible to vote for the first time. Though the PA had hoped that its broad-based support would be enough to defeat PM Gairy, it was confronted with a number of political obstacles. PM Gairy’s supposed abuses and corruption of the electoral process, and the passing of a number of laws like the banning of the use of public address systems by opposition parties, thwarted the opposition’s every move. The GULP government had a monopoly of the airwaves, and even controlled the choice of an opposition election symbol. In the end, the PA won six of the 15 contested constituencies, capturing just under 49% of the popular vote. It later protested that the election was not free and fair. It was one of the most hotly contested elections in many years. Despite the PA’s loss, the GULP government was confronted with a noticeable opposition for the first time in a decade. By 1979 many believed that “the Parliament had degenerated into a theatrical act, with Gairy always the leading actor,” and the opposition, under Bishop, a reluctant supporting cast. Some have suggested that “the Grenada Parliament had become a caricature of the Westminster model and, moreover, reflected the inherent weaknesses of that model,” leading to disillusionment in the process, and ultimately resulting in the Revolution. If there were winners among the PA, it was the NJM, which won over new supporters and gained a national platform for its leftist views.